Natalia loves to play with her style and discover new things about herself. She embraces color and print and shows that your love of style does not have to stop when your body changes after 40. Time to find out more about her unique style and how it developed over the years! Hi Natalia. Thanks for taking the time out to answer a few questions for 40PlusStyle.com. Can you tell us a little bit more about yourself? I was born and raised in Russia, in a small town on the banks of the gorgeous Yenisei River in Siberia. As a child, I had weak health and often could not join my peers in games. But I have a very loving family – my parents and my older brother Andrei, and I remember my childhood as a very happy one – lots of playing and laughter, and I’m sure it helped develop a vivid imagination and love of creativity, openness and curiosity about life. Even as an adult, I still love fairy tales, and Ivanushka The Fool is still my favorite character. I moved to the US when I was about 29 years old. It’s my 14th year living on the new continent – some might say it’s not much, but to me it rather feels like another lifetime. For the past 8 years, I live in the Pacific Northwest with my husband and best friend Justin and daughter Anna. As a point of reference which age group do you belong to or perhaps you are willing to share your age? I’m turning 42 this May, and I can sincerely say that I enjoy being this age very much. Can you tell us a bit more about your blog In The Writer’s Closet and why you created it? However, after years of dedication, we can feel exhausted and empty. I think it means that we gave much more than we received, so we find ourselves out of balance, out of source. That’s how I felt, and I’m sure a lot of both men and women experience it in their own life journey. I knew I needed to find harmony withing myself again. I did not know what exactly I needed to do, other than refocusing my life and finding my inner joy again. Writing is something I have done for as long as I can remember, so part of my healing process just had to be writing. And to my surprise, I also found a reborn interest in fashion and style (I like to say that I took a vacation from fashion during my community building years). I had lots of doubts that noone would be interested in reading about my style and me-explorations, especially in English, which is not my strong point. But with my husband’s help and encouragement, I started, and the rest as they say is history. What would you consider the most important components of your style? Color. I think it’s crucial to me. I have to say that color is a relatively new discovery to me – I credit my daughter and my husband for opening my eyes about bright colors. I was very much into more subtle colors and “elegant” looks before these two came along. I still learn about colors, I want to explore them deeper. The wonderful Eric Carle, artist, picture books author and illustrator, said in an interview that he wished he could see more colors – unfortunately, the human eye is not capable of seeing the whole spectrum. You should have seen his face when he said it – he was so genuinely sad! In my style journey, I’m now coming to a similar point – I just want more and more color. Colors are amazing! Where do you live and how does that influence your style? I live in the Pacific Northwest – in a small maritime place, not really a village or town, in between suburbs of the greater Seattle area. I’m sure that all the places that I’ve lived in before influenced my sartorial choices one way or another. In Russia, back when I lived there at least, women are expected to dress up and look their best. We can take public transportation and ride a fully packed bus for an hour or longer on the way to work or college, but we are 100% dressed up – full make-up, high heels, dresses or skirts most of the time. There are really not too many frumpy looking women in Russia – you may not fully share their choices, but you can’t deny their dedication to look good at pretty much all times. In North America, on the other hand, it is almost the opposite – the vast majority of people, both men and women, do not pay much attention to their style. I often wonder to myself, where all those fashionable clothes go from the stores? I sure don’t see many stylish people on the streets. I know it’s different in New York City, but NYC does not equal the USA. Most people in America dress very casual, and I sure had my share of casual dressing, wearing pants and jeans almost exclusively for a few years. Do you feel you have a signature style? What inspires your outfit choices the most? I really struggled with authenticity for a while. It seemed to me that I needed to find a magic formula – whatever looks best on my body and feels good to me. My wardrobe is very eclectic, I have both trendy modern pieces and vintage or secondhand clothes, and I love combining them – I think the combination of both creates such an incredible dynamic, alive feeling. I’m not always sure where to begin each day. Sometimes you just know what piece you want to wear, and everything else falls into place. But there are days when everything feels kinda blah – the clothes that you picked with love and enthusiasm and sometimes paid good money for, just seem so boring – “I have nothing to wear”, sounds familiar, right? Then Melanie of the amazing blog Bag and a Beret said something in the comment to my post, and it all fell into place for me. She said, “If I’m not feeling it, I can’t force myself. Dressing to reflect who I am at that moment, is my holy joy zone.” It’s genius. These words hit me like lightening! Of course, that is the only way when you want to explore your inner creativity – you need to connect with yourself, to look into yourself and find who you are at this particular moment – then everything clicks, and one of your most favorite outfits will be born! So to answer your question, Sylvia, it’s really hard to say what exactly inspires the choice as it is an intimate process within, and there are no two moments alike. But anything can inspire, really – nature, movies, art… Bloggers are very inspiring, one of the greatest sources. 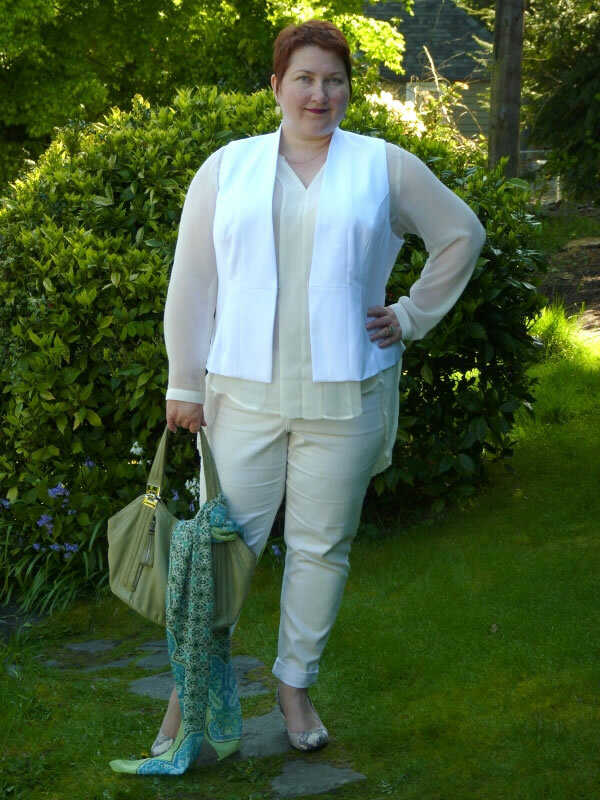 Do you take things like color profiling or body type into account when you dress? I’m intuitive. I don’t know how many times I read about Spring, Summer, Autumn, Winter types – I don’t seem to remember any of that. But intuitively I know what colors are best on me. It does not mean that I only wear those few colors though. Sometimes, I choose to wear what’s not my best color, but there is just something about that particular piece that I like. From time to time, I find new hues that suit me well, and I did not even know about it. I will share my insight about my body type. I gained a lot of weight in the last 10 years or so. Before that, I had a pretty perfect hourglass figure, and it was really very easy to dress it. When I started learning about my grown body, at first I had no clue what type of clothes would suit me. It seemed at first, that not so many types of clothes really looked good on me. 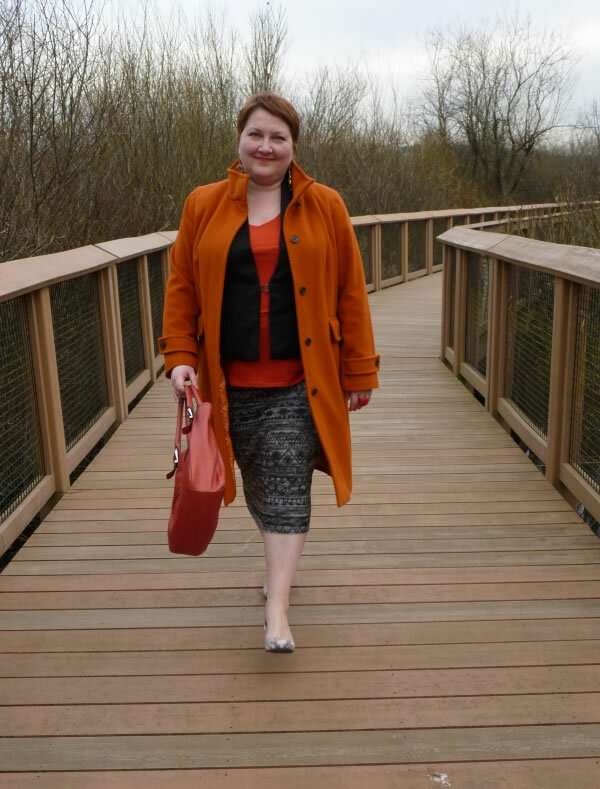 Then somewhere in the process I discovered, to my huge surprise, that my body, even though changed, is still an hourglass shape, and pretty much all the types of clothes that I loved when I was slim, still looked good on me. I don’t know if it sounds obvious to others, and they just think “duh!” – but that was such an eye opener to me. Has your style changed at all after turning 40? Yes, it did change – I became much more open to experimenting and mush less serious. Do you believe in dressing ‘age appropriately’ and what does it mean to you? I don’t. Someone you interviewed earlier, Sylvia, said that they believe in “me-appropriate” (was it Sue?). I absolutely agree with that. As a young girl, I did not even consider wearing extremely short mini-skirts, I never was especially fond of shorts either. There was nothing wrong with my legs – those type of clothes just did not feel like “me”, and that’s what personal style is all about – we want to feel like ourselves, unless of course we deliberately choose to wear a costume or break out of a comfort zone – which is a great thing by the way! I’d say, wear what feels “appropriate” to you – whatever your definition of “appropriate” is. Would you say that at this stage of your life you are now more, or less interested in fashion, style and the way you look? I’m definitely much more interested now – thanks to blogging, personal style became my major hobby. Though it comes and goes with me. I started making my own clothes as a teenager – I learned how to sew and knit pretty early in life, and was always looking stylish and well dressed, even in those years of deficit in my home country. But then there was a period when I did not think about fashion at all – its language became foreign to me, because believe me if you don’t look into fashion for a few years, you’ll find yourself wondering – whatever happened to fashion, when did it become so ugly? It took me a while to learn the language and appreciate it again. Why is the way you look important to you? I think it just adds to a person’s confidence. We want to feel good about ourselves, so we want to look good. Of course I enjoy receiving compliments and good kinds of attention too. It also tickles me to see my daughters’ interest in fashion and style – she is absolutely her own person and her own stylista since a very early age. I think when she was 8 or 9, I finally figured out that the dresses I picked for her were not worn. She needed to pick her own clothes – our preferences are just different. But from time to time, she’d look at me and create an outfit that resonates with mine, but in her own style. Or she would ask me, “Mom, can I wear this or use that?” And it makes me unbelievably happy to see and hear it. I love that she has such an independent mind, but I also love knowing that we have points where we intersect and go hand in hand – not even as mother and daughter, but rather as friends. I wouldn’t be noticed by so many blog readers, and wouldn’t get interviewed by you, Sylvia, if I did not want to look good, would I? So many things would be different… But it goes beyond that. If everyone feels good about themselves, there will be so much less unhappiness and conflicts in the world, and we all would live in a much better place then. Do you follow trends? And if yes, which trends excite you at the moment? I don’t go out of my way to read about current trends, but I learn them anyway, simply by observation – I read style blogs, I go to stores, and it’s not difficult to put 2 and 2 together. I’m happy that coral is now “in”, it’s always been one of my favorite colors, and when it’s trendy, it just means that we can find something that we love in stores and enjoy for the rest of our life if we want to. I also like to look at trends as a source of ideas. But trends do not dictate what I wear, and my wardrobe is not the trendiest one out there. 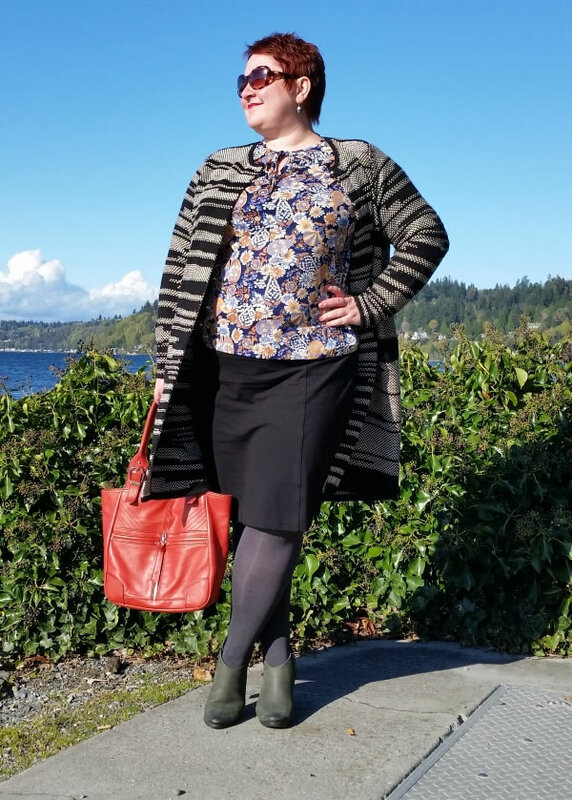 Do you have any fashion and style tips for women over 40? I don’t think I have advice about style specifically, simply because we all have different goals and preferences. But I would like to encourage people to not be afraid and just play. Dressing up in its core is the same creative process as writing, drawing, acting or… just living. We learn as we go. The more we practice, the more we gain confidence and freedom to truly be ourselves. Not every outfit needs to be a masterpiece – just follow your heart, your inspiration. Trust the little soft voice inside of you that tells you: try this or that. Do not be afraid of mistakes – they only prove that you are living and doing things. Don’t seek for approval. The amazing people that we admire, including talented stylistas, did not become amazing because they always get “approved” – they became amazing because they learned to trust their own vision and go for their dreams. Our dreams are there for a reason. Just go with them. Relax and play! What are your plans for your blog and how do you see it develop over the coming years? I like when things grow organically, and my blog is no exception. To tell you the truth, this is not my first blog – I have blogged, on and off, for over 10 years already. But it is the first one about style and the first one I wrote in English (which is not even my second language – I’m practically self-taught, and far from perfect). But somehow this combination – me blogging about style while I don’t even consider myself especially gifted at that, and writing in the language which I don’t know very well, became a magic combination. In The Writer’s Closet is definitely my most popular blog and the one that brings me incredible joy every day for the past year and a half. I wish to grow, but in which direction, only time will tell. I would love my writing to improve, I really want to grow as a writer. I never even thought that I would write in English – and here I am doing just that. Life can surprise us in the most unexpected ways, I want to stay open and continue for as long as it’s a joyful, meaningful journey to me. Anything further you would like to add? It’s such an honor to be interviewed by you, Sylvia, as I admire and respect you as a visionary who invested a lot of her time and talents into building a community of women. I got to know so many wonderful bloggers thanks to your site. A little over a year ago, I couldn’t even imagine how much love, warmth and support this community has to offer. It is healing, heartwarming and absolutely magical. I thank each and everyone who reads my blog and takes time to comment – I truly treasure all of your comments, dear friends! I thank all of your readers, Sylvia, who take time to read this wordy interview – I really appreciate that you stopped by. It feels incredible to be a part of this amazing community, to be able to contribute to it in my own way – there are not so many genuinely kind and accepting communities on or off line. Thank you! Be sure to check out Natalia’s fabulous site In The Writer’s Closet today! 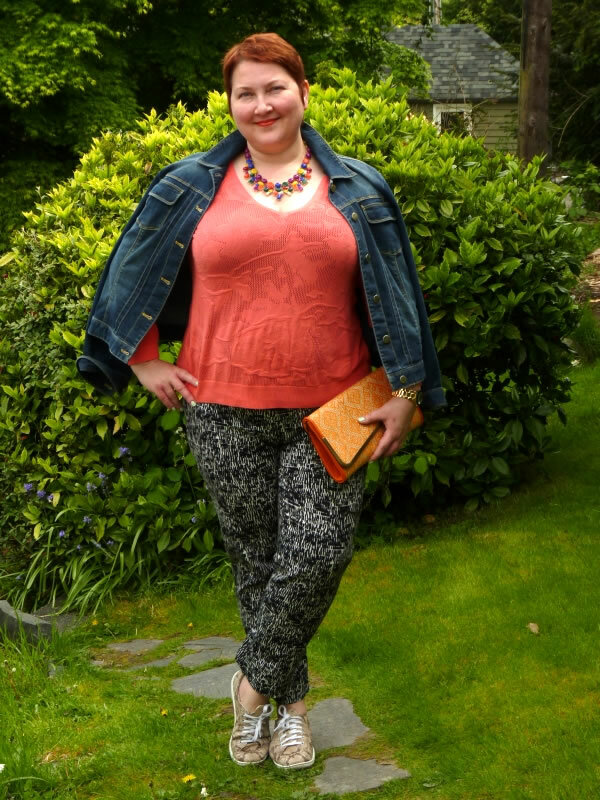 She is one of several bloggers meeting up in Vancouver this July so I hope you join us. Which is your favorite of Natalia’s outfits? Natalia looks great in every outfit, but my favorites are the black and white patterned pants with coral top and jeans jacket and then the brown and black striped dress with denim jacket. I love the way she adds the patterned purse for even more excitement! Great attitude toward life and thanks for sharing her story. Karen, I’m so happy that you liked my print mixing. In fact, I did not even think that I do it as much, but both you and Sylvia recognized it – and you are right! I do love prints as much as colors! I think that Natalia is a very well groomed person with lots of fun clothes. She looks confident and fun. A joyful personality. I think she is an inspiration to many women as she shows so well that you do not have to be size zero to look good. I love Natalia’s writing, and her style and her personality as well. She’s a delight to follow. What a wonderful compliment, Patti! Thank you so much!! What a joy to meet a lady who loves colour and print. Someone after my own heart! She has a delightful collection of dresses. 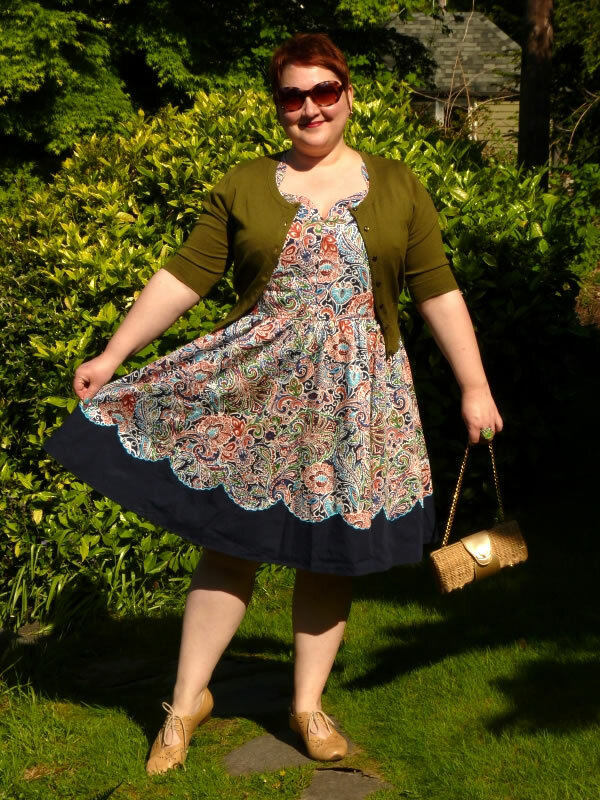 I love the printed one with the navy blue hem and how she’s teamed it with the olive cardigan. This inspires me to play around with colour and print even more. Thank you a lot, dear Petite Vixen! 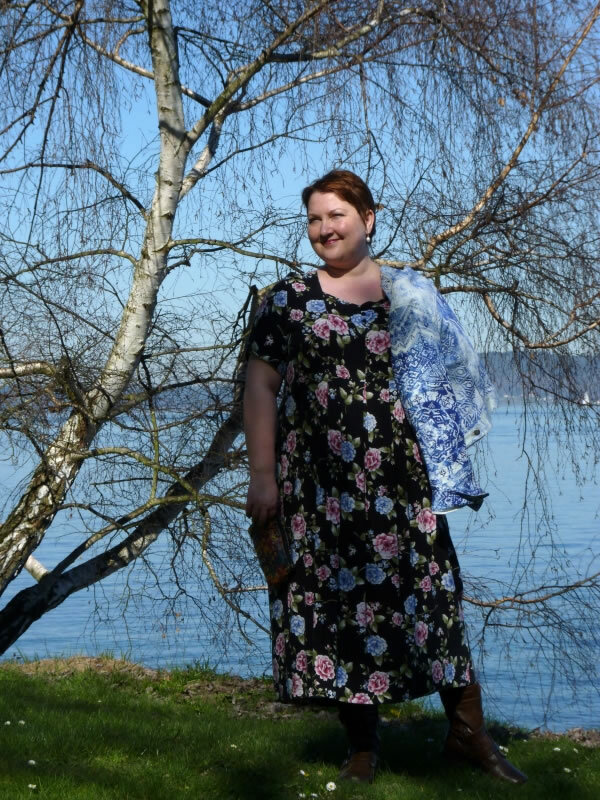 Dresses are so fun to wear (and easy to style) – I just can’t stop collecting them. 🙂 I’m so happy to hear that you feel inspired! Would love to see your style! Natalia has such a large heart and it shows. I love almost everything she wears because like me, she loves colour and pattern. Plus 90% of what she wears I would happily wear. 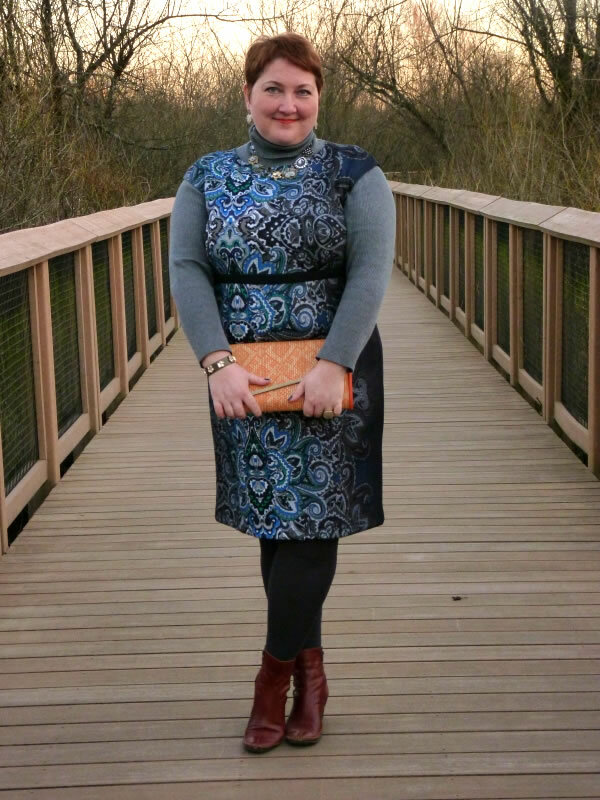 I must say I love that blue patterned dress with the turtleneck. I hadn’t seen that before I think. Such a high praise, Suzanne, as I absolutely adore your style and wardrobe! I too would wear your clothes!! 🙂 And thank you for seeing the heart, it touches me deeply. Thank you so much, Briana! I forgot to mention, but all photography on my blog is by my husband Justin who is a talented photographer, and In The Writer’s Closet truly is a labor of love for both of us. 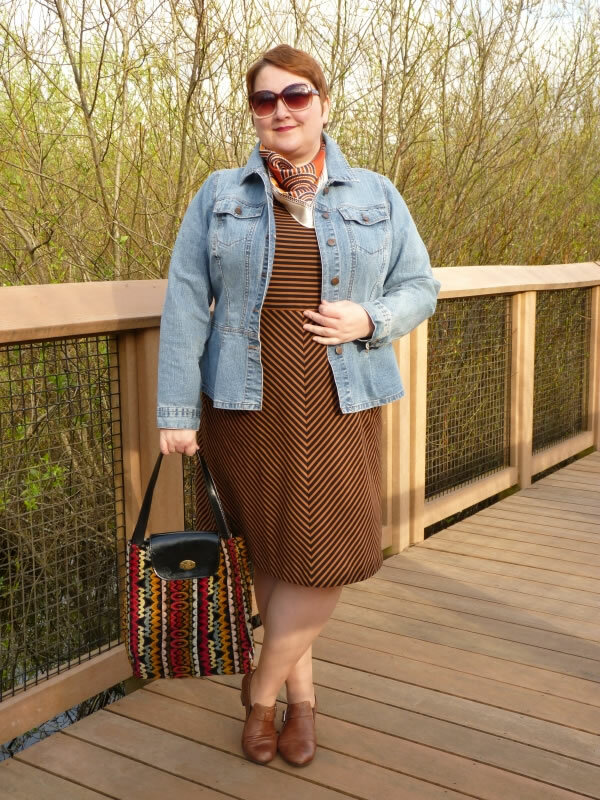 I recently got to know Natalie and her great style though my link up. I adore her use of colors and patterns. I enjoy reading her post and getting to know her. Natalia seems to shine in so many different styles and colours. It has been my pleasure to see her confidence in her own style and sense of self shine through. I love the last shot of Natalia in the pretty floral dress . Thank you so much for this delightful interview with Natalia. I love her positive attitude and flair. Her style is very creative and reflective of a distinct personality. I wonder if she still sews or knits any of her clothes? Thank you so much, Rebecca! I haven’t done any sewing or knitting recently, it’s been years. But I had to shorten curtains the other day, and as I was working with a needle and thread, I felt how much I’ve missed sewing. I literally felt it in my fingers. 🙂 So I definitely can see myself sewing and knitting again some day! thanx sylvia fot that lovely interview!!!! Thank you, Beatochka! Lots of love to you, dear friend! This was another lovely interview Sylvia. I really enjoyed looking at the photos — and was wondering who took all those great photos — so glad you added your husband is your photographer. He does a wonderful job. Natalia, you have great style, but I was even more interested in all of your meaningful comments about your life and challenges, especially about working so hard, losing balance, and having to find some harmony and joy again. You are right, I think many of us can relate to that. You provided me fashion ideas, but I think you are a profound philosopher too! Thanks for sharing both. I love Natalia collection of dresses,but my favorite was the brown and black striped dress. She has a great attitude towards life and was quite a joy to read. Thank-you so much for sharing her story.. Thank you very much for your kind words! 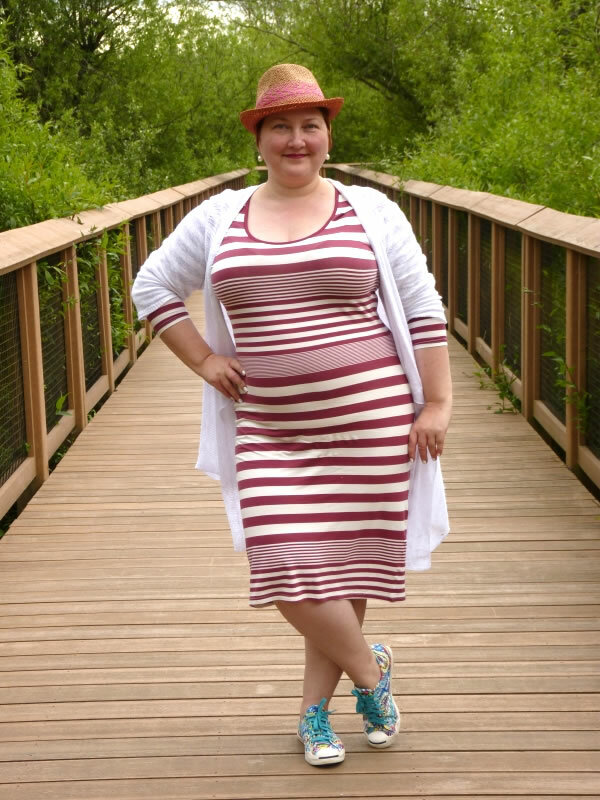 The best part of that striped dress is that it is sleeveless, and you can easily put on a turtleneck or a feminine blouse under it – and completely transform the look! I love it too, it says “1960s” to me, and I love that period in fashion. Thanks for highlighting Natalia here, Sylvia. She is an amazing woman in her style but also in her outlook on life. Seeing all her outfits together in one place is very impressive. And in her writing she often pinpoints so well what I am feeling – the way trends infiltrate our thinking, the way giving back can also take if there is an imbalance. And the recognition of style as a joyful welcoming. I am honoured that something I wrote resonated with her as well. I am so deeply touched by your comment. Melanie, as I admire you so much! Thank you! Hugs to you! This is a woman with style! 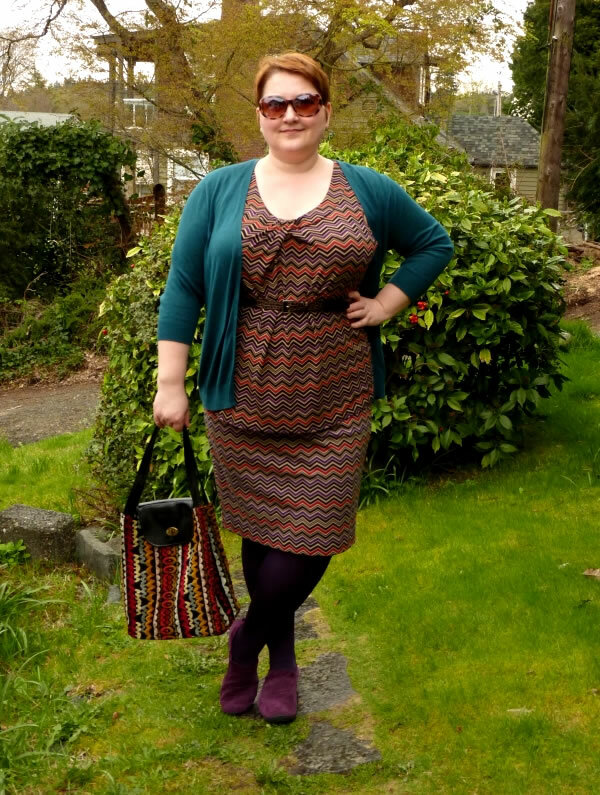 I love the way she puts together patterns, and especially that she isn’t afraid of COLOR! 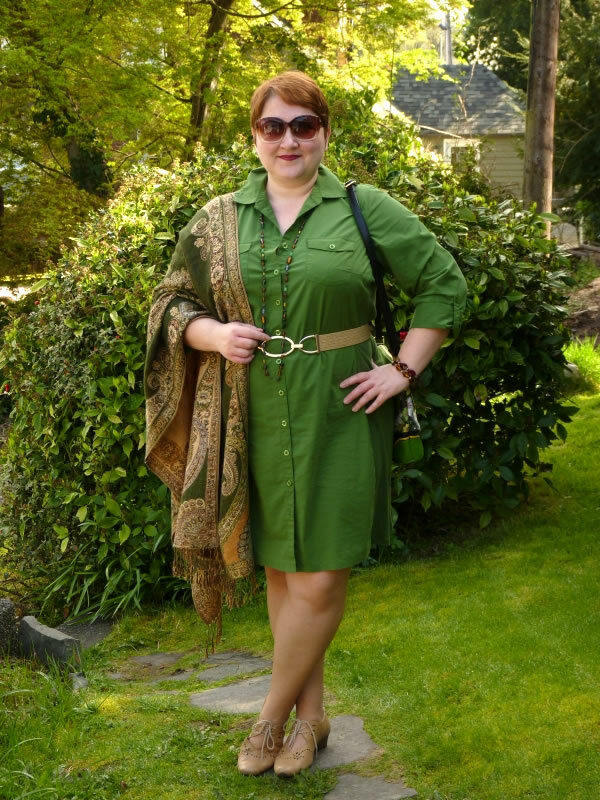 The first outfit is my favorite – the green dress is gorgeous with her hair color and complexion. Beautiful lady! ruin your look with that silly posture. I really enjoyed reading this interview…Natalia, you’re an inspiration! I absolutely agree with everything that you wrote. The world would be a happier place if everyone would feel happier about themselves and if everyone learned to accept their body type. Thank you so much for your heartwarming comment, dear Ivana! You are always so very kind, thoughtful and insightful – thank you! 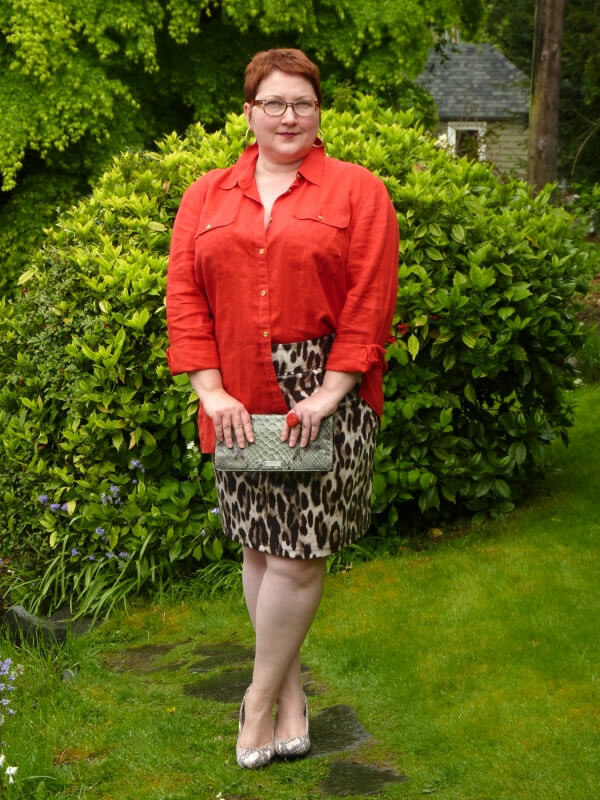 Next post: What to wear to a wedding – What Lorraine and other 40+ women wore!